Published: Oct. 24, 2010 at 06:02 p.m.
(13:02) J.Cutler pass short middle to M.Forte to WAS 24 for 11 yards (R.McIntosh). FUMBLES (R.McIntosh), RECOVERED by WAS-A.Carriker at WAS 25. A.Carriker to WAS 25 for no gain (C.Williams). 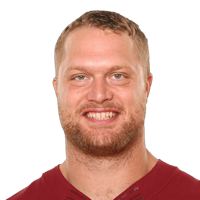 Published: Oct. 24, 2010 at 03:44 p.m.
Redskins DE Adam Carriker falls on a Bears fumble.